9 PM on a Sunday evening. Whilst most normal people would be sat relaxing with their feet up having a beer or glass of wine. 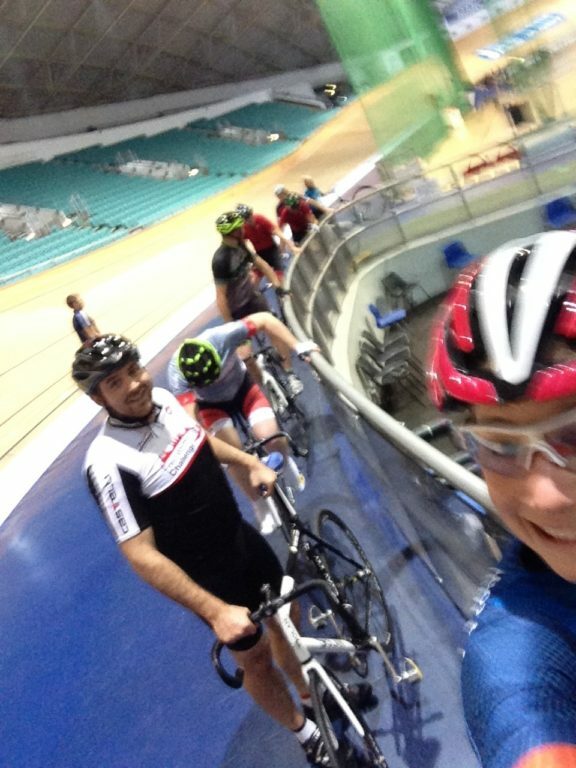 The Merlin Team were at the Manchester Velodrome for some pedalling-around-steep-banking action. The Velodrome is 250-metres long and made of Siberian pine. The banking is steep at 42 degrees from bottom to top so at first sight it can seem daunting. However there are no tricks to ride it, just pure, simple physics. 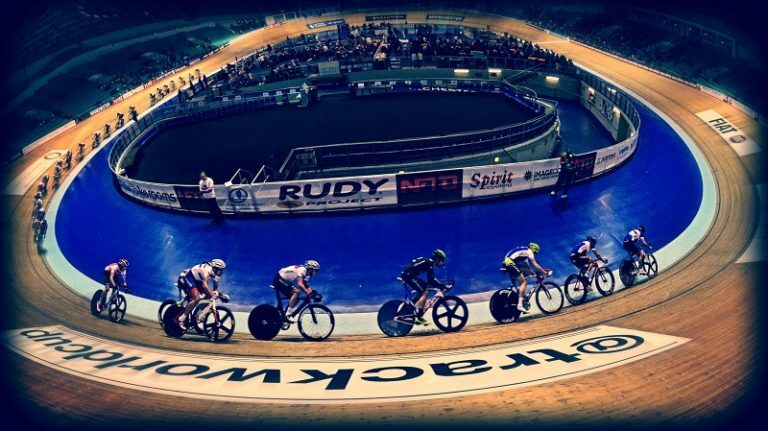 The velodrome has been the core of British Cycling since the mid 1990’s and has been the backbone of its successes of recent years. Track bikes are like fixies – fixed gear, but with no brakes. There is no need to worry about gear selection, obstacles, cars or traffic lights, which makes things kind of easier. With a fixed gear bike, the pedals continue to turn even if you stop pedalling (Note to self – if you ever do try to stop pedalling you will get a very quick wakeup call!) The Velodrome hire bikes all had the same gearing (50 x 16) and equipment. For some it is their first taste of track cycling, and others a long awaiting comeback to the wooden boards. We were lucky to have British Cycling Coach, Simon Wilson, coaching us. We had the GB Academy on the track just before us – there was a lot to prove. Although with the selection criteria for the achademy being under 23, I don’t think that they were particularly under any threat. After our initial briefing it was time to lean on the perimeter fence and get clipped in. We first learned the art of stopping and starting, which takes a little getting used to on a fixed track-bike. After a few laps of the Cote d’Azur (the blue painted edge around the inside of the track), everyone made their way on to the track, some folk took a bit longer, but with some coaching everyone was able to get up and riding on the blue line, midway up the track. For some there was the heart stopping realisation that you are mid-way around the 42 degree banking! The buzz and excitement was second to none. Whilst track cycling for the first time can seem frightening, as soon as you are up and away, it is instantly addictive. By the end of the hour, nobody had crashed and everyone was buzzing with excitement! 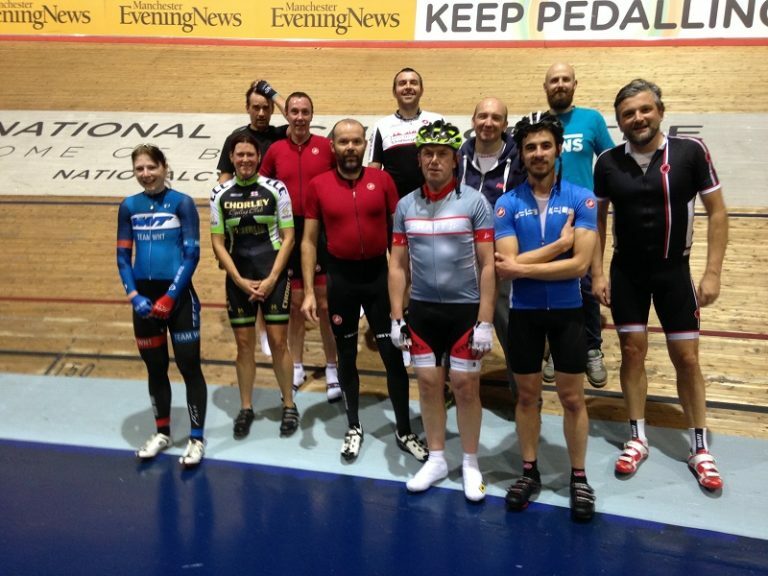 Until the next instalment in the New Year….. that was Merlin Cycles at the Velodrome. Tagged fixed wheel, manchester velodrome, track bike, velodrome. Bookmark the permalink.